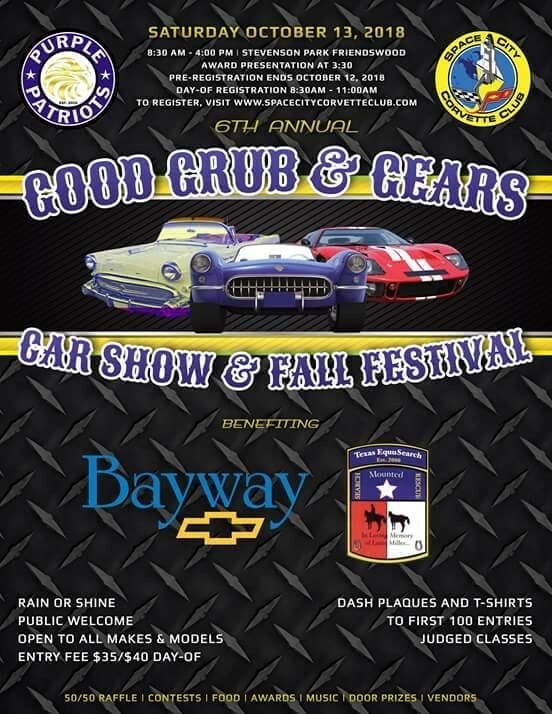 09/05/18 — Space City Corvette Club will be holding their annual Fall Festival Car Show at Stevenson Park, 1100 South Friendswood Drive, Friendswood, TX 77546. The hours for the Festival are from 8:30 a.m. to 4:00 p.m. The Festival is open to the public, and will be benefiting Texas EquuSearch. It will be held — rain or shine. We encourage everyone to come out and enjoy the cars — they always have some of the finest Corvettes in the area. Additionally, they have many classic cars. Please stop by the Texas EquuSearch booth to meet some of our volunteers.